Designers often overlook the importance that part orientation plays in the final quality of a 3D printed part. This article discusses how part orientation impacts the part accuracy, manufacturing time, strength and surface finish of your 3D printed parts and addresses the importance of build orientation by technology. 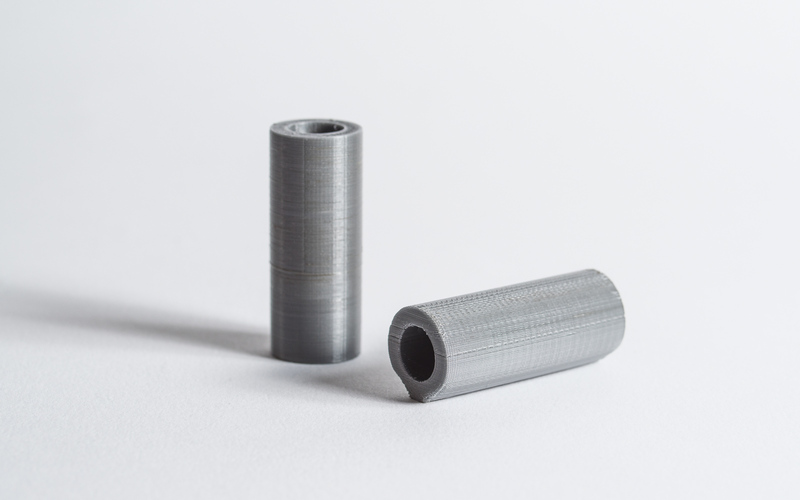 Consider a cylinder with a hole (10 mm outer diameter, 6 mm inner diameter, 30 mm length) that is printed with FDM with its center axis vertical. The 3D printer would construct this part as a series of concentric circles layered on top of one another. This would produce a final cylinder with a relatively smooth outer surface. If the same cylinder is reorientated with its center axis horizontally, the part will be built as a series of rectangles (with slightly different width) layered on top of each other. Also, the surface of the cylinder that touches the build platform will be flat, because the material would as the initial first layers were printed. By orientating the part in different directions, there is a significant difference in the print quality, as can be seen in the photo below. Orientation can also have a significant impact on print time. Using as an example the cylinder of the previous section, the horizontal orientation will take significantly less time to print than the vertical, as the total number of layers is significantly reduced: at a 100 μm layer height, the horizontal cylinder will be printed with 100 total layers and the vertical with 300 layers. This can add up to significant time differences for large parts. Some 3D printing (notably FDM) build parts that have inherently anisotropic properties, meaning they are much stronger in the XY direction than the Z direction. For functional parts, it is important to consider the application and the direction of the loads. For example, FDM parts are much more likely to delaminate and fracture when placed in tension in the Z direction compared to the XY directions (up to 4-5 times difference tensile strength). Support material adds extra time and cost to a 3D print. Often a lot of designing time is spent to the optimal part orientation to reduce the likelihood of print failure and the amount of required support. More information on how to optimize the use of support in a design can be found here. For FDM, the top surface is smoothed by the extrusion tip, the surface in contact with the print bed will usually be glossy and the surfaces above support structures will have support marks. For SLA, the lower surfaces will have support marks and require post-processing, while the top surfaces will be smooth and free of support marks. Parts printed with a powder bed 3D printing processes, like SLS and Binder Jetting, will have a more grainy finish on their lower surfaces. Parts printed with Material Jetting will have a matte finish at surface printed on supports and a glossy finish otherwise (a homogeneous matte finish is also available). Orientate cylindrical features vertically for a smoother surface finish. Consider the direction of the loading when choosing part orientation of a functional part. Part orientation is most important for FDM and SLA/DLP 3D printing processes.